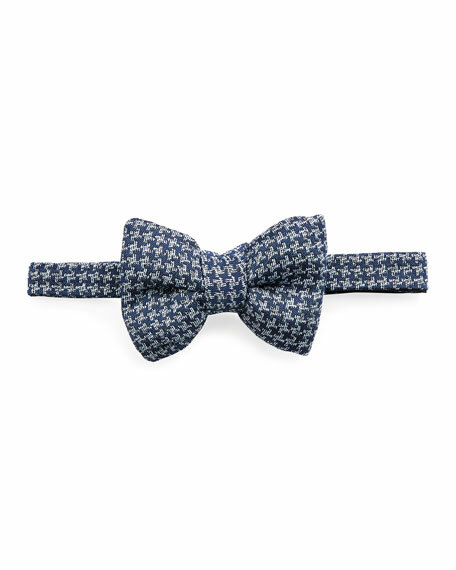 TOM FORD bow tie in houndstooth. Brackish Bowties pheasant feather (USA) bow tie. Feathers are handpicked, so each bow tie will vary slightly. Packaged with care instructions in wooden storage box. Grosgrain wrap at center; satin band with hook closure. Made in USA. Brackish Bowties "Chuka" bow tie with natural chukar feathers (Pakistan). Wrap-around adjustable hook. Feathers are handpicked, so each bow tie will vary slightly. Packaged with care instructions in wooden storage box. Imported. Brackish Bowties "Rutledge" pheasant and guinea feather (USA) bow tie. Feathers are handpicked, so each bow tie will vary slightly. Brunello Cucinelli basic bow tie in satin. Adjustable fit. Self-tie. Cotton/silk. Made in Italy.